"SAGER". 3.053" high x 2.024" wide x .739" deep. Brass case. Steel shackle. Mfg by: Sager Lock Works. Yale & Towne Mfg. Co. Purchased Sager in 1925. "SEGAL". 1 5/8" wide. Brass case. Steel shackle. Mfg by: Segal Metal Products Co. US Patent #1439131. US Patent #11580574. "SLOAN". 1 1/2" wide. Brass case. Steel shackle. Made for: Sloan Lock and Key, Munhall, Pennsylvania. Mfg by: Best. "S.O. Co.". Size: 4B62-M1. 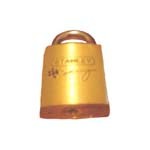 Padlock Stamp #: 0006-E. Color: Green. Made for: Standard Oil, San Francisco, California. Mfg by: Best. "STAINLESS STEEL". 1.940" high x 1.154" wide. Stainless steel case. Stainless steel shackle. Mfg by: Eagle Lock Co.
"STANDARD STATIONS INC.". Size: 2B509. 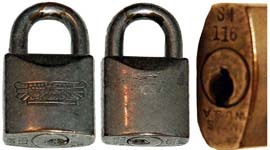 Padlock Stamp #: 0218-F. Color: Green. Made for: Standard Stations Inc., San Francisco, California. Mfg by: Best. "STUTZ". 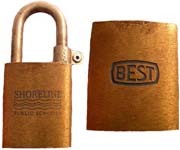 1.650" high x .980" wide x .200" shackle diameter. Brass case. Brass shackle. Nickel plate finish. Mfg by: Corbin Cabinet Lock Co.